Just over a year ago, I started this blogspot. It took a lot of courage to get out from behind that curtain and face the music. But I did. And then, I froze. Faced by a wall of my own making and a blank sheet with so much to say, yet unable to put it down. Now here I am again trying to crawl out of the hole I put myself in. Cowered by the events that are taking place all around me. Things I can not do much about - like climate change and this winter which really feels more like spring; the religious wars in the Middle East; the hundreds of thousands of refugees coming onto European soil; the Zika Virus carrying-mosquito in Brazil where my daughter has planned to spend her summer vacation; the house in Hilversum that I would like my son and his family to live in, except they want to stay in Amsterdam. Unlike Atlas, I will have to put the worries of the world down and concentrate on the things that are relevant to me. Daily. Not globally. There are enough brilliant people (as well as some not so) taking care of that . These are what matter .. to Alma. The beginning or the end of each year seems to be I-Will time. I will lose 10 kgs before the summer to be able to get into my bathing suit . I will read The Economist faithfully every week so that I will be more informed about world affairs. I will bake my Christmas cakes in August so that they will be really drunk with rum by December. I will empty my wardrobe of clothes I have not worn in the last 10 years so I can buy more 2016-looking clothes. And then there are the Never-Wills. I will never eat chocolate again. I will never have my hair cut by that hairdresser again. I will never volunteer to do any thing again. I will never interfere in my children’s lives again. I will never lay myself open to hurt again. The trouble with Never-Wills is that - You Just May Again. I-Wills are easy. You can always defer to tomorrow or even next year. But well, Never Will is so permanent. They are carved in stone. Like the Ten Commandments. 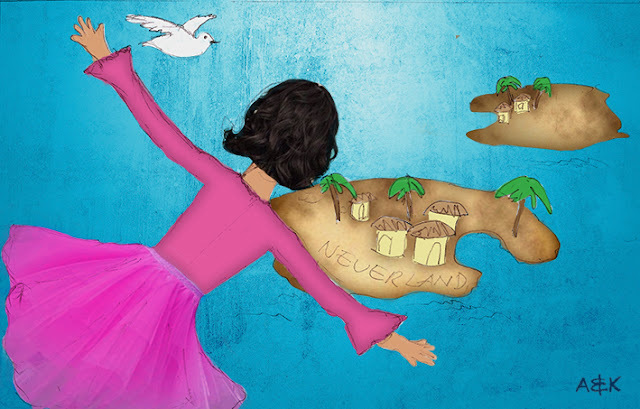 Never-land is confining. In Never-land, you are a captive of your own self. There is no room for escape. Not even second chances. In the end, all you really have is an emptiness that is hard to fill. Maybe even Never? My mother, a very practical woman, always told me – write your ultimatums on water instead. Because life can not be measured in finite quantities. Nor does it have boundaries, much like love and friendship. We all have our visions of what love is or what friendship must be. But love and friendships are fluid. Always moving, changing its course often, reshaping its surroundings as it goes. Seeking the big endless ocean. Of Forever More. Will I eat chocolate again? Yes, but I will be careful. I will make sure it is worth the after effects of my lactose intolerance. At least 70% real chocolate studded with nuts. Yum! Will I have my hair trimmed by that lady again? Maybe, but I will be careful. I will make sure to tell her what I want done and ask her how much it will cost. No more surprises. Will I volunteer to do anything again? Yes, but I will be careful. I will make sure that I make room for someone else to take over and allow myself the luxury of being helped. Will I interfere in my children’s lives again? You bet! But I will be careful not to be overbearing. I will allow them to make their mistakes just as I have made mine. And yes, I will make sure to always let them know that their Dad and I are constantly there in the wings, ready to help when asked. Will I allow myself to be hurt again? Of course, I will. But I will be careful not to bare my soul to a person I have just met. I will take the time to let a friendship develop. And, I will try not to expect my friends, old and new, to fit into the definition of friendship that I have set for my self. Am I never going to Never-land again? Maybe. But I will tread ever so carefully. thank you, Carla! Seeing you skiing and skateboarding makes me think that yes... we can do whatever we want. All we have to do is to try. I am really in awe. And your new business venture, please tell me more. you make us all feel young! Great to see you are back in the saddle Alma. Love your writing! Hi to Louis for me. Thanks, Peter! I shall keep on trying. We miss seeing you around Hilversum. But seeing you in that snowy landscape makes us so happy that you are in your elements. Groetjes from Louis too.